Well hello! How is everyone holding up in the summer heat so far? Today I am sharing with you one of my new favorite ways to cook pork. 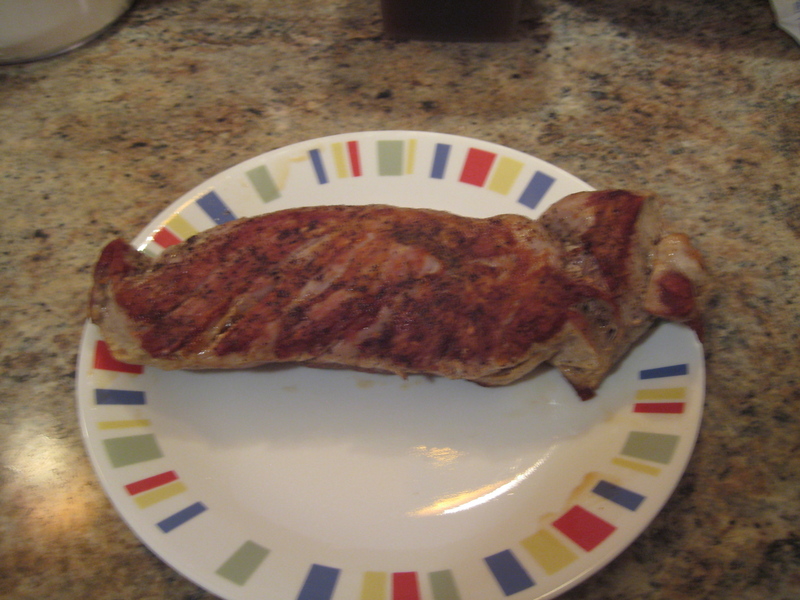 For those of you who don’t know, roasting a pork loin is actually my favorite main to make for dinner. And I know no one wants to turn on the oven in this heat, but I’m telling you, this one is worth it! AND, I promise to post some cold dishes soon. Also, before we dive into this yummy recipe, I wanted to let y’all know I have an Instagram account now and I try to post to it several times a week with different things I’m cooking and some of the delightful treats I make at work. Check it out! AND, if you love reading my blog, do me a solid and subscribe to it, so you never miss a post. You’ll receive an email every time I post a new article. Preheat oven to 425 degrees. Heat an oven proof skillet or pan to medium high heat. Add 1 1/2 tsp of oil to the pan and swirl to coat. Coat the pork with salt and pepper and add to hot pan. Brown the sides of the pork for 4 minutes, turning so that all sides are browned. Just look at that lovely browned pork; brown food is good food! After browning the pork put the pork in the oven and cook for 20-25 minutes. The thickest part of the pork should be 145 degrees. The pork can also be tested for doneness by making a small cut in the middle of the pork loin and checking that the juices run clear rather than cloudy. 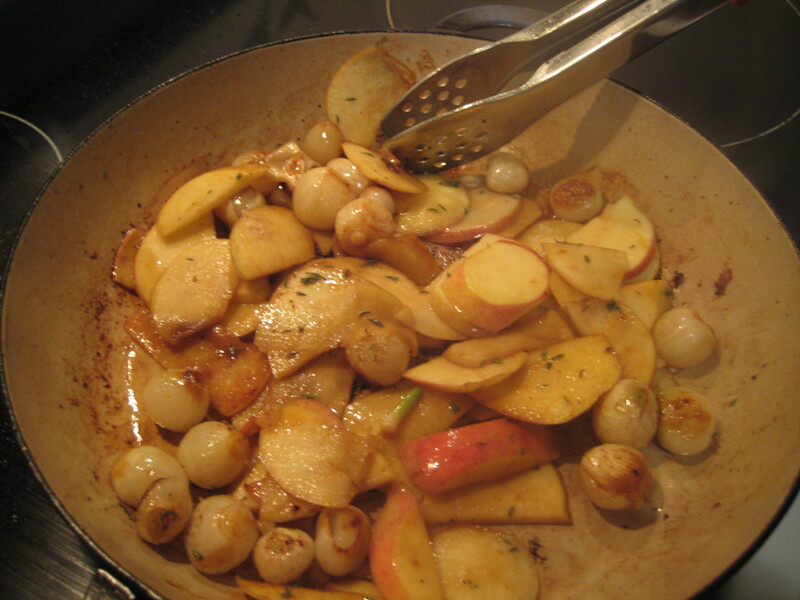 While the pork is cooking, prep the apples and onions to make a delicious sauce. First let’s talk about these guys; pearl onions. So here’s the thing; if you can find a bag of frozen pearl onions, you should use those opposed to unfrozen ones that need to be peeled, because as it turns out these are actually a huge nuisance to peel. 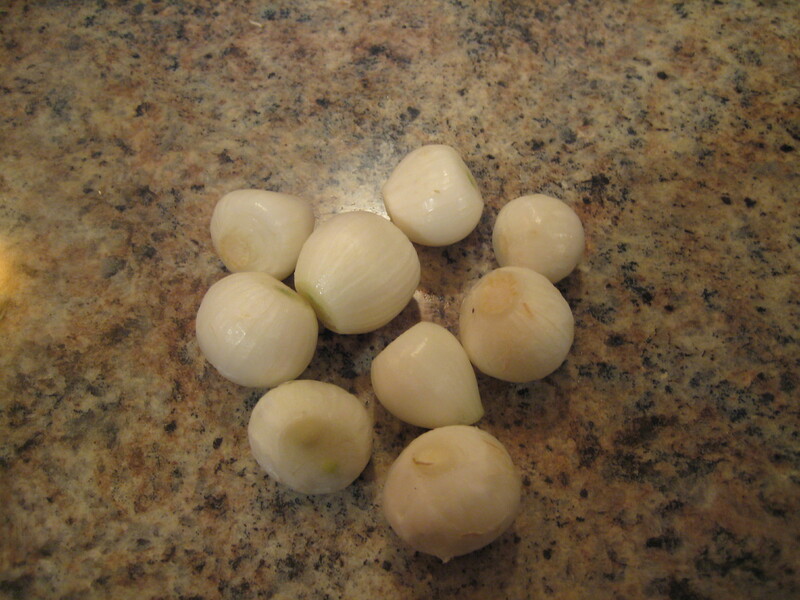 SO, if you cannot find frozen pearl onions, I recommend slicing up a yellow onion instead. Ok, back to our sauce; first either pat dry the frozen pearl onions or chop up a yellow onion so that you have 1 1/2 cups of onions. 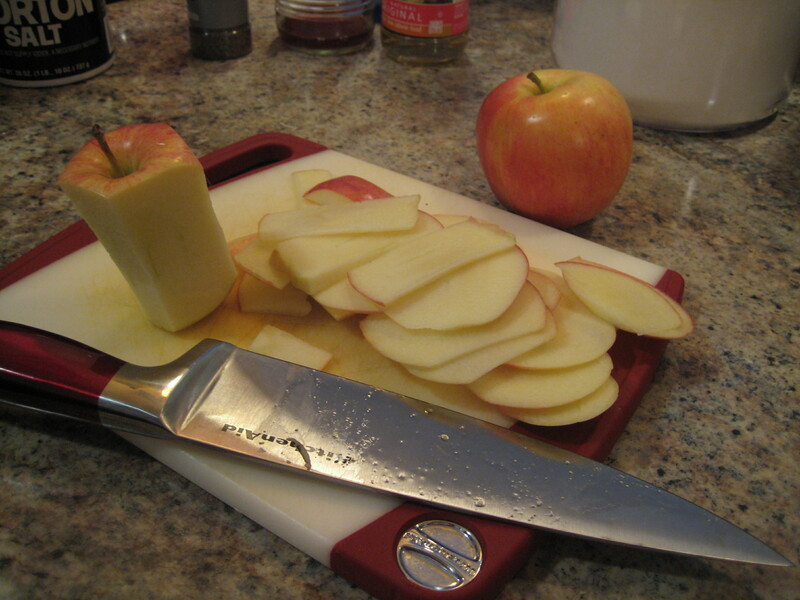 Next slice up 2 Gala apples. 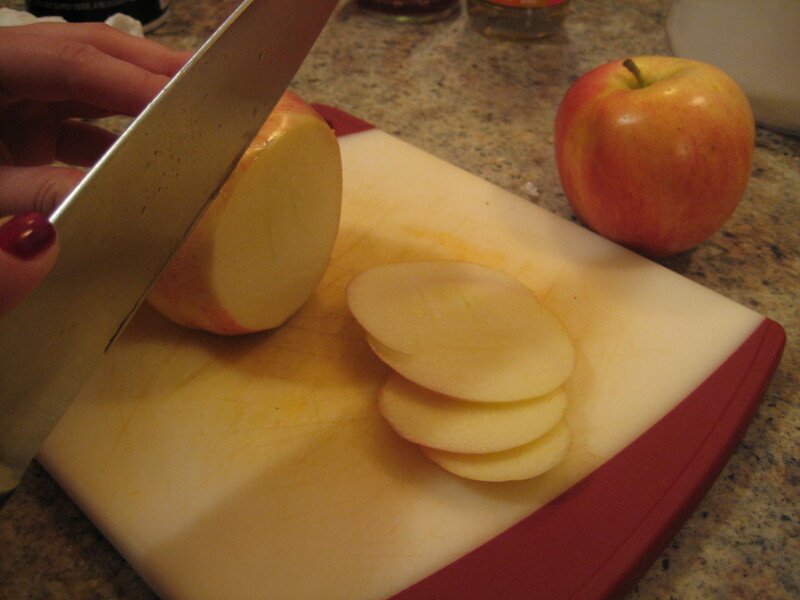 For this recipe I like thin slices so that they cook up quickly. 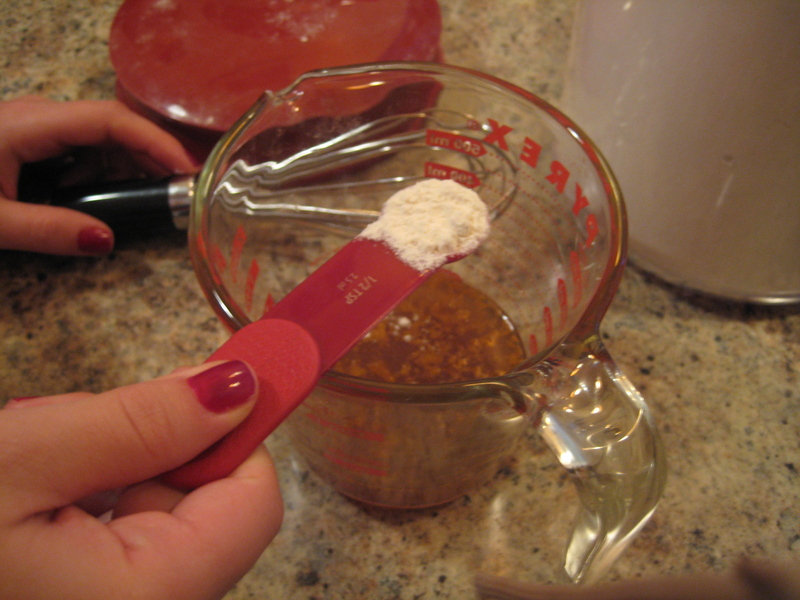 Next dissolve the flour into the chicken broth. 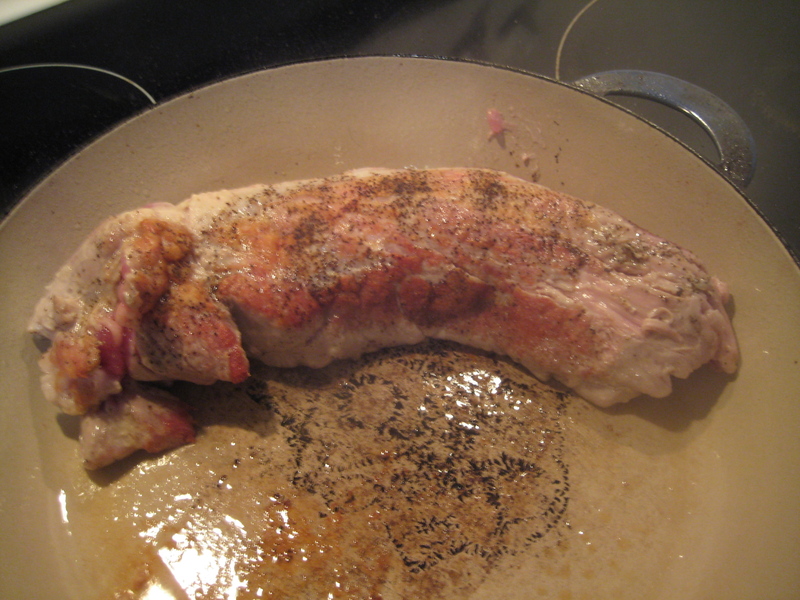 When the pork is done, remove it from the pan and let it rest on a plate. Using the same pan that the pork was cooked in, saute the onions and apples over medium high heat for 2 minutes or until the onions are browned and the apples are cooked. Next add the broth and fresh thyme to the pan and bring to a boil scraping up the brown bits from the bottom of the pan. Cook until the broth is reduced to 1/4 c (about one minute). 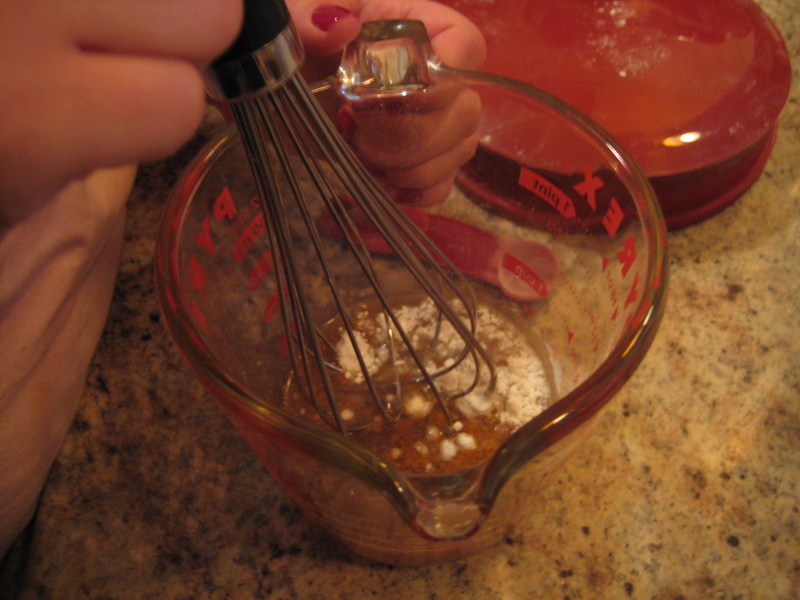 Stir in vinegar and butter and remove from heat. 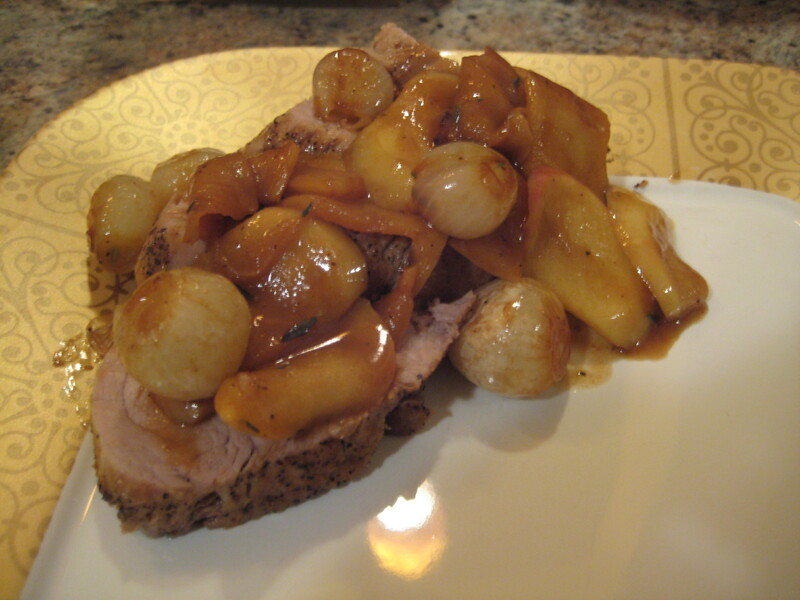 Finally, cut the pork loin into slices and serve with the apple and onion sauce. Serve with a glass of chilled white wine and a green veggie side and you’ve got yourself a delicious meal. Enjoy! Preheat oven to 425 degrees. Heat an oven-proof skillet to medium high heat. Add 1 1/2 tsp of oil to the pan and swirl to coat. Coat the pork with salt and pepper and add to the hot pan. Brown the sides of the pork for 4 minutes, turning so that all sides are browned.